that we provide as a free service as part of Webmaster Tools. If you manage a website but haven't signed up for Webmaster Tools, don't worry. The messages will be saved and if you sign up later on, you'll still be able to access any messages that Google has left for your site. Quick note from Matt: In general, it's a good idea to make sure that your webserver's software is up-to-date. For example, the current version of WordPress is 2.6.2; not only is that version more secure than previous versions, but it will also alert you when a new version of WordPress is available for downloading. If you run an older version of WordPress, I highly encourage you to upgrade to the latest version. Recently we've seen more websites get hacked because of various security holes. In order to help webmasters with this issue, we plan to run a test that will alert some webmasters if their content management system (CMS) or publishing platform looks like it might have a security hole or be hackable. This is a test, so we're starting out by alerting five to six thousand webmasters. 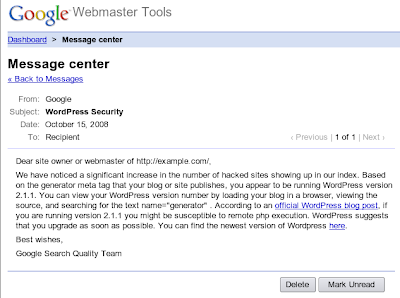 We will be leaving messages for owners of potentially vulnerable sites in the Google Message Center that we provide as a free service as part of Webmaster Tools. If you manage a website but haven't signed up for Webmaster Tools, don't worry. The messages will be saved and if you sign up later on, you'll still be able to access any messages that Google has left for your site.